Before I had kids, I was a morning person. I would wake up, get ready, and leave for work before my husband was even awake, with a travel cup of coffee and breakfast to eat in the car. I would arrive at school before the doors were unlocked, and the other early birds and I could socialize without guilt and still have plenty of time to get our prep work done. I never really worried about traffic, or rushing to get ready to teach my first class. I was awake, organized, and ready to go. And having such a productive morning let me sit down and relax at the end of the day, when I was mentally drained from teaching. Then my evening at home was open - I could exercise, clean, relax with a book or a show. I felt organized. I felt in control. I felt prepared. Then I had one child, and it got harder, especially when I was trying to maintain my pre-baby work routine on top of the daycare drop off and pick up, pumping, and caring for a baby. I wasn't going to bed early and bouncing up at 5:00 am with a full night's sleep. I was dragging my perpetually sleep deprived self up, rushing to get both of us out the door, getting to daycare as it opened, and still rushing when I got to school. Sure, there were two parents helping, but it was a far cry from my normal routine. I was disorganized. I was frazzled. I was always behind. Then I had another child and I left teaching to stay home. Two kids under two isn't exactly relaxing, no matter if you're working or not, but it did allow me to relax when it came to mornings. I wasn't trying to get out before the sun rose. The earliest we ever had to be out of the house was 9:00, so when I had been awake with a baby overnight and was trying to dress two kids and myself, I could cut myself some slack. I stopped using an alarm clock and simply got up when the first child roused me. This was survival back in the early days of infants and toddlers, and I did what I needed to do to maintain my home and my sanity. I don't regret changing my routine - life moved in a different direction and I had to. But now that the girls are older, what I've found is that I've developed some pretty poor morning habits. They're admittedly bad all year round, but much worse in the winter when I hate feeling cold and just want to hibernate in bed. I wake up late - usually as the girls are waking up. They go downstairs in their pajamas. I spend the next chunk of time messing around with my phone in bed. I check social media, I play a few rounds of a game, I read news, I waste time. I look at the clock and panic when I realize how much time has passed. I rush downstairs and panic that the girls are doing essentially what I've been doing on my phone with their iPads. They aren't dressed, they aren't eating, and they aren't ready. Neither am I. Now I rush, short on time and temper, to get myself and one kid showered (thank goodness that the other showers at night), to get a preschool lunch packed, to get the homeschool school stuff organized, to get everyone dressed, to do everyone's hair, and to make sure that the girls have some sort of food in their bodies. They fight with each other, I yell, they cry, we all frantically search for lost items. I eat or drink nothing, because there's no time. They eat cold bagels and dry cereal. We all rush frantically out the door, just on time. We're never actually late, but we're always on the cusp of it. We never make it to the low key preschool playtime before circle time starts, and I'm mom cursing traffic lights on the way to co-op because I will never have time to set up my lesson. Totally relaxing, and a great way to start the day. So I'm hungry, cranky, under caffeinated, stressed, unprepared and frantic, with two children who are rushed and panicky and feeling like they make me mad every day. And I feel guilty and vow to do better. I spend all day catching up, stay up late so I can finally breathe...and do the whole thing over again. So when January rolled around, I decided it was time to start kicking the bad habits and picking up some good ones. Sure, as of June, we won't have preschool drop off and we'll be full blown homeschoolers with the benefit of never missing the bus. But we'll have dance competitions and morning classes and homeschool co-op. And while I love the freedom homeschooling gives us, one of my pet peeves is that the moms are always late. Always, always, always. I used to want to scream "WE START AT TEN!!! HOW ARE YOU LATE????" I refuse to have that mom be me, even though I think I get it now. Here are the habits I'm trying to develop to make my mornings successful. Get some things ready the night before. When I know it's just me in the morning, I set the timer on the coffeepot overnight so I wake up to a carafe ready to go. Blending in the ghee and brain octane takes under a minute, and I have good coffee to start me off. Set an alarm. I do hit snooze once, but I don't go back to sleep. It's sort of a double alarm: first is to wake up, second is to get up. 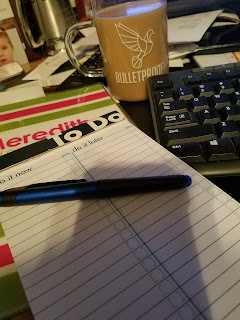 After I wake up, I reach for a pad and pen next to me and review my day: what needs to get done before we leave, and what needs to get done once we're home. Stop charging my phone next to my bed. If it isn't within arm's reach, I can't waste time before my feet have even hit the floor. Make getting some nutrition the first thing I do. I know I need to start small, so right now, I'm having a cup of Bulletproof coffee with a Greek yogurt. Between the brain octane, the good fats blended in, and the good quality coffee, I have lasting energy and fewer headaches and short tempered moments. No tech until we're ready - this goes for everyone. Once you are showered, dressed, packed, and eating, you can use technology until it's time to go. So far, it's not perfect. I tend to get overly confident if I start out on the right foot, and slip back into the time wasters and wind up rushing to catch up. I make my coffee, but then I get involved with one the girls and forget to drink it. And the girls hate the tech rule. They've gotten so used to going straight for the iPad that it's been a tough habit to break. But habits aren't formed in a day, and we've been trying to make sure we're keeping each other on track. I remind the girls to get dressed and ready when they first wake up, and they remind me to get out of my warm comforter and start moving. And we all cheer when we all make it out on time! This post is sponsored by Bulletproof Coffee, but all experiences are my own. Even the embarrassing ones.